Well made, functional piece. No assembly! Adds to the home and does not look cheap, recommend. Shipped quickly, protected well arrived with no damage. Quickly finding what you need has never been easier. This handsomeCape Cod 6-drawer storage unit from Safavieh has charming country aesthetic,perfect for transitional homes. Featuring four wicker baskets, as well as twotop drawers, this piece offers ample storage space while providing anadditional surface for lamps, books, flowers, or other treasured accessories. Constructed with a sturdy pinewood frame in distressed black,this storage unit has a contemporary and functional design. The contrast ofnatural wicker with dark hardware makes this a piece of distinction, addingclass and an organic vibe to any decor. Its quaint disposition ensures that itwill work equally well in a compact apartment or a spacious family room. Great product just like the photo!! I really like these nightstands. They were exactly as advertised. The only thing that people should know is that if you want to take the baskets out and use the space as a book shelf or something that there is nothing below the basket but an empty hole. I was hoping for the versatility of using it partially as a book shelf which is NOT possible. I don't use the baskets as much but I still love the style, I think it is beautiful, sturdy, and stylish. My favorite thing was that it is delivered completely assembled which for the price is an excellent deal!! Overall I am extremely happy with the purchase! I put this in our tiny bathroom that has no storage. Fits nicely, although it came with a few flaws. Since you couldn't see the flaws too well, I decided to keep it. My only problem with it is that the drawers are a little awkward to pull out. They are just baskets sitting in the wood openings, so I'm guessing over time that the wood will become nicked and the baskets will unravel. For the price, I guess it's fine for now, but def not durable for the long run. This arrived fully assembled, so no "IKEA moment" here! :) It's an OK product for its price, especially with a coupon thrown in. I actually saw it for $80 less at my local Marshall's just the day before my order arrived, however it was so beat up I'm glad I waited for my delivery. Mine arrived in perfect condition. This looks just like the picture but a lot smaller. It's a very nice color. The top two drawers are wood the bottom four are wicker and functional. It will be good for toys or t.v. remotes. It comes assembled, all you have to do is take it out of the box. I like it but it is a bit small. I would recommend it if you're looking for something on the small side. Ordered 2 of these one showed up very damaged and unusable. Overstock sent a replacement quickly but that one showed up damaged as well. It is cheap wood but I believe it was UPS mishandling the packages. Overstock was very understanding and gave me a refund. I loved that the storage unit came assembled right out of the box. Perfect storage for what I needed in my craft room. Like others have mentioned, there are gaps under the baskets so don't expect to put something other than baskets there. A clean classic look. Nice piece but there is no bottom under the baskets - just a outer frame for it to rest on. Also, finish is distressed lightly with a reddish color. Packaging was great. Look is nice - has a matching 3 drawer which is nice to get a matching set. This storage unit is perfect as a bedside table. In great condition and updates my decor perfectly. I am pleased with the unit size and black color. I am very disappointed with shabby construction of the baskets! One week of use and the straw is already shredding all over items in the basket. The is no bottom under the cabinet so the baskets don't slide easily also making a mess from shredded straw. I am going to have to make a fabric lining for the inside and maybe felt for the bottom to try to correct this problem. Annoying to say the least! Buying new baskets is too costly for a cabinet that's been used one week! Under the baskets there is no stability - no wood panel. so it makes a mess rubbing the baskets apart and baskets tip when used, spilling under the cabinet. Other than that it is visually what I ordered. the size is what make this item special. it's more of the size of a nite stand. which is perfect where it belongs. next to bed with lots of pictures and the extra drawers 4 the extra space you would want or need. perfect for a short wall. it's not a dresser size at all think nite stand . Wicker dresses wooden frame. nice !!! Well made --nice color and will serve the purpose of hiding toys in the family room. A definite plus that it is already put together. Height is good for end table. Wished that I had ordered two. Looks great, functional, easy to assemble, and reasonably sturdy. This product was exactly what I wanted. No assemble needed! Super sharp looking and sturdy! Love my purchase!! "IS THE HEIGHT CORRECT ON THE SPECS? SEEMS VERY LOW"
Hello j30, the manufacturers details verify the measurements are correct. Thank you for shopping with us. My daughter is furnishing her first office. "what does the back look like - does it need to be up against a wall or is it black wood on the back?" Thanks for your interest, the back is fully finished. 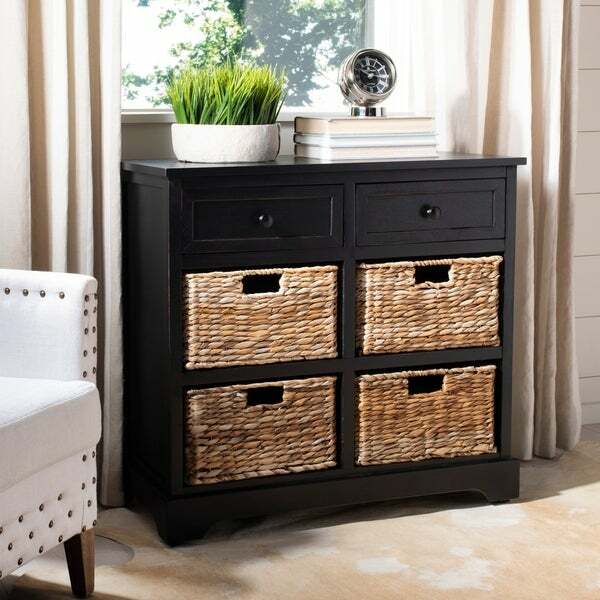 Safavieh Damien Black 3-drawer Storage Unit - 42.1" x 15.4" x 19.7"
Safavieh Cape Cod 3-Drawer Black Storage Table - 15.9" x 13" x 27.6"